The guys from A Story Told have a lot to be thankful for this year. Their first full-length, Keep Watch, gained over one million streams on Spotify and earned them a spot on Vans Warped Tour in 2016. Their second full-length, Good Looks, dropped earlier this year and has a strong theme – pure sarcasm. Other than the sarcasm, the theme of the album touches on the concept of ‘good looks aren’t everything’ and what that concept means to them. Coming from their last record where the theme was a more serious subject matter, they knew that this time around they didn’t want to be labeled as ‘the sad band’. With a layer of irony poured over the lyrics, the album is able to show a sense of fun while still holding onto a more serious undertone. The opportunity to think outside the box really comes from the fans. The band never expected anywhere near the response they got from Keep Watch and were totally blown away by its reception. They didn’t have the support of a big label or a big management team; just five guys and a supportive musical community. 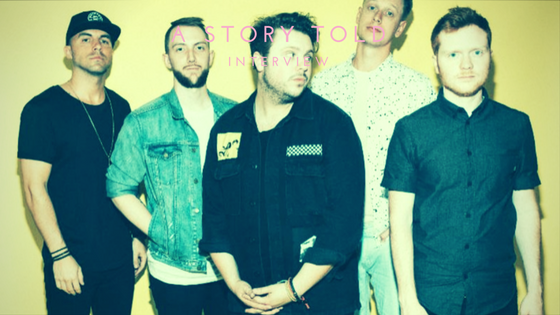 A Story Told took their loves of pop and rock music and built their dream from the ground up. With the motivation from a supportive music community, they’ve been able to make two successful albums and don’t plan to stop there. And for that, they are incredibly thankful.